Downtown Disney will continue to see changes as it transforms into a more family friendly dining, shopping, and entertainment center. 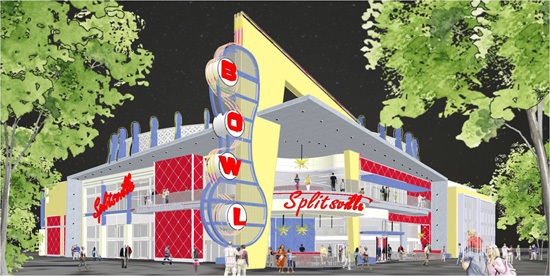 This fall, construction will begin on Splitsville, a 50,000-square-foot upscale entertainment center that combines bowling with billiards, dining, music and nightlife. To make way for this experience, RIDEMAKERZ, currently located on the West Side, will move to the Marketplace. The Walt Disney World Resort has been transforming the Downtown Disney Pleasure Island area from an adult themed nightspot to a location that features entertainment, shopping, and dining that is suitable for teh entire family. 1 comments to "Downtown Disney Welcomes Splitsville This Fall"
We are excited to see a new attraction at Downtown Disney!